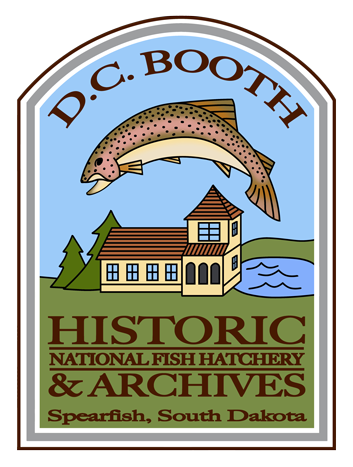 Prairie Berry Winery, Crow Peak Brewery along with other distributors are teaming up with the Booth Society at D.C. Booth Historic National Fish Hatchery for a festive holiday wine, beer and hot chocolate tasting in the historic Booth House! Tour the historic home while sampling wine and beer paired with light hors d’oeuvres. Enjoy live piano music and carolers. The Booth House will be donned in her best holiday decor for the event! The event will be from 3 – 7 pm. Stop in the gift shop for Christmas shopping. Great stocking stuffer items, home decor, jewelry, accessories and educational items. The gift shop will be open from noon to 8pm. 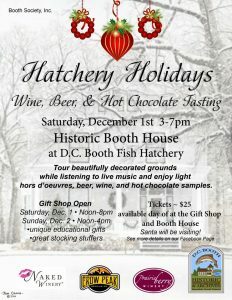 Plus…Santa will be at the Hatchery with goodies for the little ones from 3pm to 7pm! Entrance to the gift shop and to see Santa is free. Tickets for the wine/beer sampling can be purchased on site for $25 each.